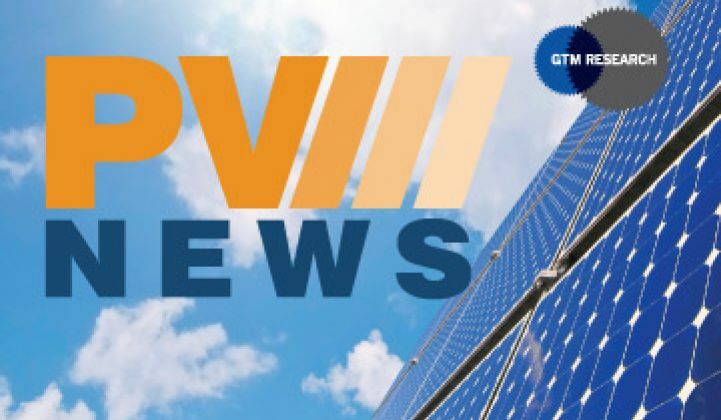 With the latest GTM Research estimates putting global PV demand at 17 GW in 2010, and with another 18.5 GW of demand expected in 2011, established players across the spectrum have been trying to grab a bigger piece of the PV pie. This past year saw significant developments in terms of acquisitions and consolidation from the very top of the supply chain (polysilicon production) all the way to the bottom (project development and power sales), as well as lateral acquisitions and joint ventures between major players. While many large companies can afford to move in either direction, it has been downstream integration (into module production or project development) that has dominated the landscape. Downstream integration holds significantly more promise across most levels of the industry, as long-term structural undersupply of input components has not yet manifested itself. For example, firms with an in-house polysilicon supply will have a definite edge over other wafer suppliers in the long run, and will also possess a measure of predictability as to the most important component of the wafer’s cost structure; however, given ample polysilicon supply over the next few years, this is a less pressing directive and more of a long-term consideration. An illustrative example of a completely vertically integrated solar company is Hanwha Chemical. Already involved in the production of polysilicon and project development, the company’s acquisition of wafer, cell, and module producer Solarfun enables the recently renamed Hanwha-SolarOne to lower costs across the entirety of the production and installation processes. 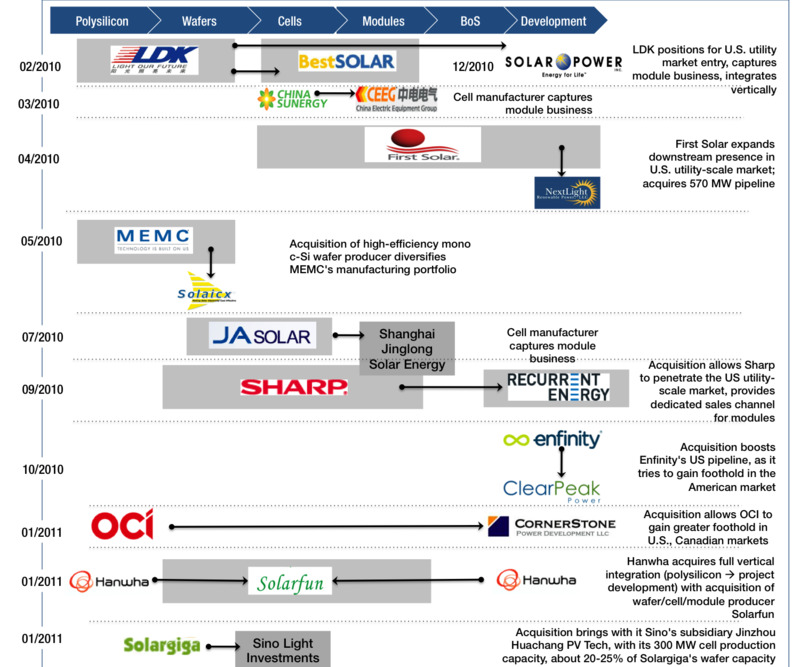 Another example of nearly complete vertical integration from the top down is MEMC, a polysilicon producer that has so far sold PV wafers largely through tolling arrangements with contract manufacturers. 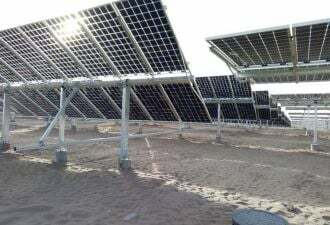 Starting with its acquisition of developer SunEdison in 2008, it has since purchased Solaicx, a high-efficiency wafer producer, and has entered into a joint venture with Flextronics to manufacture MEMC-branded modules for exclusive use by SunEdison. Missing from the value chain is a cell production line, which would subsequently lead to the manufacturing of modules in-house. MEMC’s acquisition of Solaicx follows a trend where many manufacturers have adopted an integrated wafer-polysilicon model. 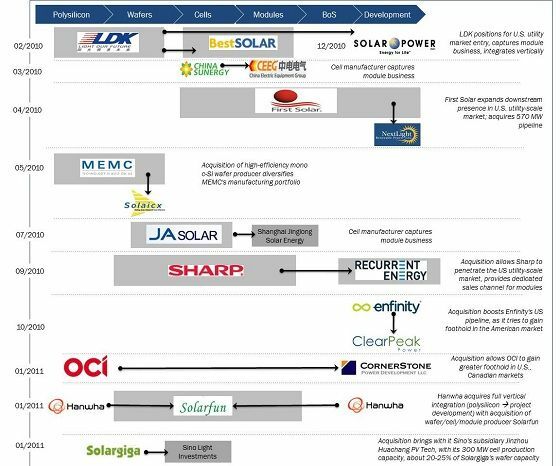 Other firms include REC, M.Setek, LDK, Renesola and Yingli, though these companies have moved upstream as opposed to MEMC’s downstream acquisitions. In the past year, there were a number of module producers acquired, as can be seen in Figure 1. Given that module assembly involves little or no IP, entering this space allows both cell and wafer firms to potentially expand their margins with little or no risk, and gives them an advantage over both pure-play wafer/cell and module firms. At the same time, since it is a low-value-add step, there is a definite benefit in farming module assembly out to a contract manufacturer, as it negates capital risk and modules can be assembled near key markets, which would reduce shipping costs to end-customers. In the case of wafer firms, cells can be procured via tolling arrangements with cell producers, as done by Renesola and LDK. To continue reading, please subscribe to PVNews! 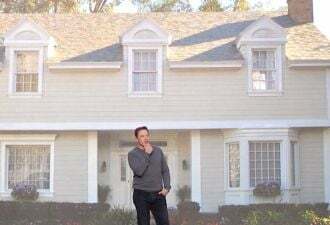 Many of these topics will also be discussed in great detail by executives from leading solar companies at the upcoming Greentech Media Solar Summit, which will take place March 14-15 in Palm Springs, California!